Harvard Business Review found that 75% of all startups fail. This shows a big waste and Ries argues that this is due to lack of theory to guide startups instead of falling back on not appropriate corporate business plans. “a human institution designed to deliver a new product or service under conditions of extreme uncertainty. So what this doesn’t include is the size of the company, the sector or the industry, but what it highlights is extreme uncertainty. This occurs when there is no existing example that one could follow – this could be the case in a company when a new team is developed. Building a startup is messy and boring. To help guiding this we need to look at startups as experiments where the aim is to get to Validated Learning as fast as possible. This is achieved via creating hypotheses and the Build – Measure – Learn feedback circle in which we build a Minimum Viable Product to test our hypothesis. If we can no longer continue this learning circle we need to Pivot or in other words change directions while staying grounded in what we have learned. Finally, as a startup we can show investors the results via Innovation Accounting. In this form of accounting instead of focusing on product completion we focus on learning. 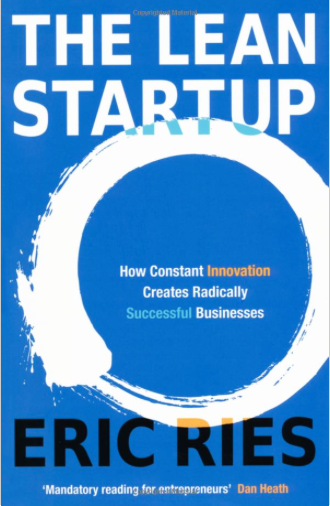 If interested you can buy the book on http://www.amazon.co.uk/The-Lean-Startup-Innovation-Successful/dp/0670921602.